Worldwide, one out of every five deaths of children under age five is due to a water related disease. Clean, safe, drinking water is scarce. Today nearly one billion people in the developing world don't have access to it. These are but a few facts that our church knew we could not ignore. So we decided to take the water challenge. We are excited to report that Holy Redemption has already made a donation to a project in Rwanda. 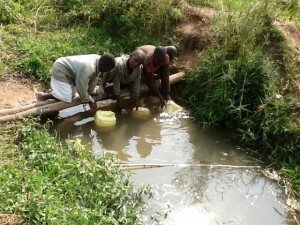 The community of Nyacyonga is now drinking clean, safe water! We'd like for you to join us in continuing to help assist people in need of clean drinking water. Consider, a sick child can't attend school and a sick adult can't work. Please, accept the Lord's initiative and help those in dire need. Help eliminate this needless cause of sickness and mortality. Help those in developing countries today, so tomorrow they can began to lift themselves out of poverty.